Digital Scholarship applies an evolving set of methodologies and modes of engagement to existing scholarly inquiry. It also invites opportunities for new collaborations across disciplines. The organizers of the Digital Scholarship Faculty Retreat seek to contribute to this dialogue by hosting an intensive workshop designed for faculty and graduate students to engage with concepts, methodologies, and tools while, at the same time, build community and identify support networks. After attending, attendees will be able to incorporate new digital concepts, methodologies, and tools directly into their own teaching and/or research. Open to all faculty, postdocs, and graduate students working in the Humanities, Social Sciences, and Sciences at Tulane. The program is free for all participants. Attendees will be provided recommended readings ahead of the Retreat to prepare them for meaningful participation. The Retreat will take place in Howard-Tilton Memorial Library room 308, a digitally-equipped smart classroom offering several large digital displays, projector, microphones, the ability to record, and 30 WIFI-enabled laptops with charging station. 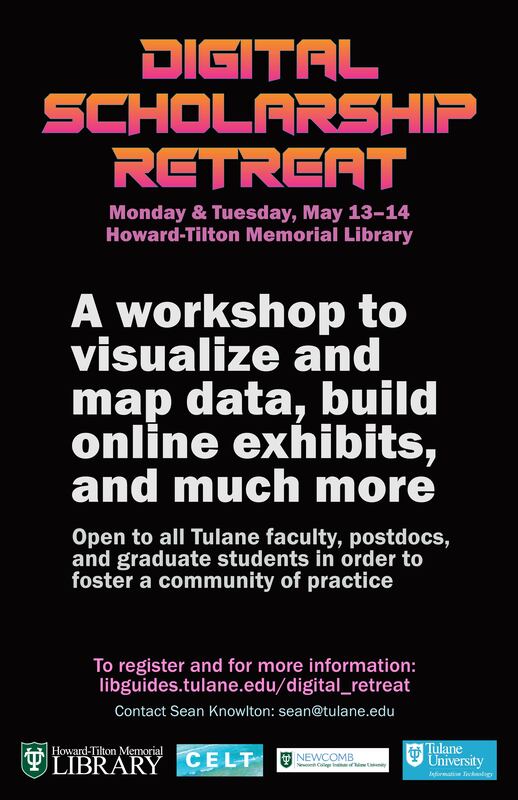 The Digital Scholarship Retreat is an event hosted by H-TML with support from campus partners: Tulane IT, Newcomb College Institute, and CELT. Sessions will be facilitated by experienced librarians at Howard-Tilton Memorial Library along with invited campus partners. Here is our working list of sessions in development for the Digital Scholarship Retreat.